A basement’s structural integrity is vital in determining a building’s overall shape. Cracks and leaks in a home’s foundation may start off as hardly noticeable, but they are a sure sign that irreparable issues to the home are inevitable. Since the soundness of a home’s foundation is subject to environmental changes, it’s important to monitor carefully the basement for initial signs of distress. The following are three starter steps to take when evaluating a home’s core structural integrity. 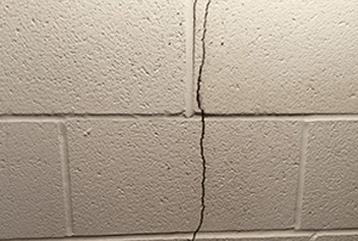 As the soil beneath the foundation shifts due to weather change, cracks can form in the walls, making way for leaks and mold. Cracks can be horizontal or stair cracks. It’s important to look for them where the basement floor meets the walls, as those cracks promote flooding. Two more telling signs of a compromised foundation are a musty smell throughout the basement and water on its floor. The basement does not need to be visibly flooded to detect the alarming presence. Even small wet patches on the floor indicate that the foundation is no longer waterproof. Little bits of water can cause mold, which in turn causes a musty smell in the air. Many homeowners ignore faint scents such as these, assuming that a basement is supposed to have a bit of a smell to it. This assumption is not true; a structurally sound foundation will not emit any apparent mustiness. Signs that a home’s foundation is in trouble can be detected outside of the basement as well. For instance, doors and windows that do not close properly are a sure sign of shifting. This shifting is never a good sign for structural integrity because the more the home shifts, the more it is susceptible to the deterioration of its walls and floors. When walls are visibly collapsing, the need to restructure the home’s foundation is dire. Once you detect any of these issues, foundation repair specialists should be called in immediately. Small issues can be solved swiftly, preventing headway for larger problems in the future.